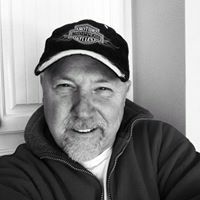 There about 40 million decks in the US. About 1/2 of them need either repairing or replacement. The cause? Improper construction or/and lack of maintenance. July 28th – 2013 :: Tinley Park, IL Fourteen people were injured Saturday night after the second-floor deck of a home in the 16700 block of Beverly Avenue collapsed during a party at the residence. We recommend homeowners watch for these 5 warning signs of unsafe deck construction. That’s a method of construction that creates a series of solid connections within the structure. These connections transfer the weight or “load” from the deck through its frame and then to the ground and/or adjacent support structure (typically your home). If your deck is built with a continuous load path, it will be better equipped to resist forces like wind, snow and earthquakes. If you’re building a deck or have an existing deck, you should know how to evaluate its construction to make sure it’s structurally sound and safe. A strong deck uses proper structural connectors and fasteners (like nails and screws) and includes regular maintenance. 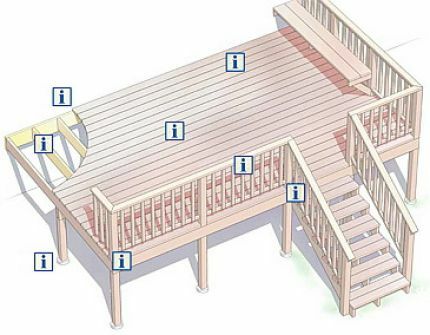 The ledger connection, where the deck connects to the house, is the most common failure point on a poorly built deck. It’s very important to use lag screws (SDS) or through-bolts rather than nails to secure your deck to your home. The floor joists intersect into a beam or ledger board and must be properly secured. The beams must be secured to the joists that support the floor of the deck. The post must be properly connected to the beams underneath the deck. 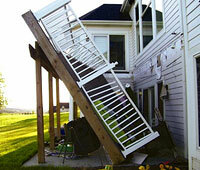 People often get injured due to weak or wobbly railings on a deck. The railing must be properly attached to the perimeter of the deck as well as the floor joists running underneath the deck. The stair stringers that run along each of the stair steps (or treads) must be secured to the deck framing. Each stair step (or tread) must be tied to the stair stringers. Post bases are used to connect the post to the footing or concrete slab underneath your deck.